Thoughts about discipleship, life and living. If Mystic, CT was where I felt the first hints of what a vacation needs to be, my time in Gloucester, MA was where it truly began. 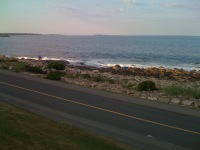 From the moment I arrived at the Bass Rocks Inn on the shores of Cape Ann, I knew this was going to be special. A huge accident just before reaching Boston and another just outside had delayed my arrival by hours. My frustration was mitigated by a quick stop at Friendly's Restaurant and the trip to Gloucester itself, but I was lamenting not being able to experience downtown Gloucester during business hours. Only 56 miles from New Haven is the idyllic seaport of Mystic, CT. Everything New Haven may not have been for me, Mystic certainly was. It also wasn't an unknown. I first visited Mystic in August of 1997 on a journey of an entirely different sort. What I remembered was a village that was a delight to see and experience. This time was no exception. 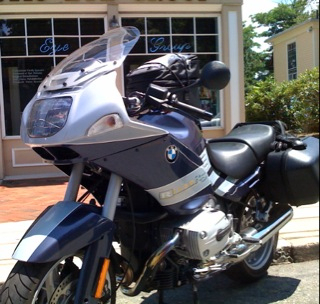 The first thing I did was find my favorite place to park: right in front of "Optimystic Eyewear" on Water Street. And just as was the case eleven years ago, there was my spot! Off to a great start. The next order of business was to walk the one block to Mystic Pizza for lunch. I've done this twice so it is now a tradition. What to eat? Why, the "House Special" of course! The only problem here is that they don't sell this variety by the slice, one has to order at least a "Small". Since I couldn't take it with me I did what anyone would -- I ate the whole thing! And yes, they do have "Mystic Pizza" the movie playing on a screen for all to enjoy. The decor had changed a bit and they have done some remodeling in eleven years (the telephone booth is no longer there) but it was still the same charming place. It was a fantastic experience. If it's Tuesday, it must be New Haven. I awoke Tuesday morning a bit tired from Monday's long ride but nevertheless determined to explore a new city! I had never before been to New Haven, CT and I was excited about the possibilites. After all, any place home to a prestigious University like Yale has to be a fantastic place. I can summarize the experience in a word: Disappointing. I realize I am not a professional traveler, nor am I a trained travel writer. Still, I have visited cities all over the world and, like most, can get a sense of a place after only a short while. I was unprepared for the underwhelming feeling that pervaded every moment I spent in New Haven. I'll have to research this but it seems New Haven has suffered from a combination of over industrialization and a lack of proper zoning and city planning. Frankly, a good bit of this part of Connecticut could be described this way. To be sure I did not see the whole of the city and there are undoubtedly sections of beauty and delight. It's an historic place! Yale is there afer all, and it definitley has a certain amount of charm. It just isn't surrounded by any. I may get a hate gram or two for this, but give me Harvard and Cambridge, MA any day. I had fed the parking meter only enough change for one hour and twenty minutes. That was more than enough time. Glancing at the digital clock on the motorcycle I realized things had actually worked out well. 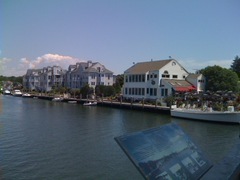 I would be having lunch in Mystic! My heart soared. On the spot I decided to eschew US-1 for Interstate 95. I know, I know. But there really isn't much to see on the "coastal road" in that part of Connecticut. It's too far removed from the coast. Besides, more time in Mystic meant more time for enjoyment, and I was definitely ready for that. 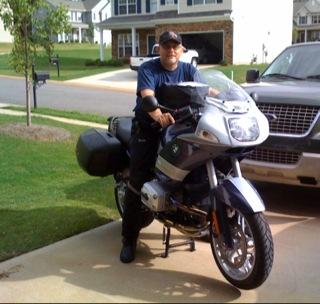 As promised, here is my top five list of things you may not know about traveling on a motorcycle. 1) Motorcycles are amazingly adjustable (at least the good ones). My windscreen has five settings for angle of deflection. This is helpful in varying temperature and weather conditions. The suspension has adjustments for pre-load, damping and rebound. Even if you don't know what that means, it's impressive. The seat has three settings for height and/or knee bend. The brake and clutch levers are adjustable for reach. The headlamp is adjustable and the handle bars have multiple settings for wrist angle and reach. All but the handle bars are easily done by the rider. The handle bars require a dealer and a special wrench. Monday was a long traveling day. According to the odometer I rode 750 miles. There was some distance to make up! Not many pictures or stories but I would like to make three observations. In the next post I'll tell you some things about motorcycles and riding which you may not know. The picture is representative of my "rest stops". Why Starbucks? It's the coffee! And the Wi-Fi is free. 1) The United States has one of the world's best road systems. I've driven and/or ridden roads in the developed, developing and under developed world and there is nothing quite like it. To travel thousands of miles knowing only a series of numbers is amazing. 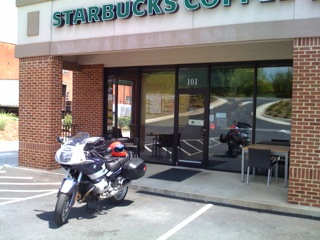 Now, lots of motorcyclists hate riding Interstates and many avoid them completely. I don't blame them. Interstate highways are dangerous places. Things happen very quickly and often unexpectedly. But if the day's goal is to get somewhere there is just nothing better. 2) America is a beautiful country, and the Southeast and Northeast are especially so any time of year. I rode through seven states today: NC, VA, WV, MD, PA, NY and CT and it was a wonder to observe the changes in landscape, agriculture and industry. Simply gorgeous. 3) All the states have their beauty and charm but Pennsylvania got my vote today. You have to love a state with such cool names like "Kennybucket" and "McAdoo" and with a DOT that had the time, money and inclination to mark not only the miles but the tenths of miles. No kidding. Not only that, they used a variety of ways to do so! First, the tenths were expressed as fractions: 1/10, 2/10 and so on. Then the fractions became decimals. Each of these were printed below the mile number which was stacked vertically above, separated by a line. Next, the tenth was printed as a whole number all with a vertical orientation. Each successive mile was oriented horizontally. But the Coup de Gras was that occasionally a mile marker would be flipped to vertical with a "0" tenth underneath! It was most entertaining, but it certainly did make the miles go by much more slowly. Slow miles notwithstanding, I did make my goal of spending Monday evening in New Haven, CT. It's a great feeling! 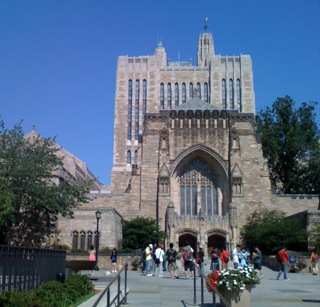 Tomorrow I'll ride back downtown and visit the hallowed halls of Yale University. I add this because those who know me will be shocked to learn I spent only $6.27 for the entire day's food budget! I won't bother with the details. It just doesn't matter. The Chinese say the longest journey begins with the first step. Others say the first step is the most difficult. Today both were true. We used to play in Jazz Band a tune called, "I Can't Get Started". That's a perfect description. There was a moment when I was convinced this New England trip would never happen. When I was finally able to leave the house I checked the long-range radar on my phone and saw a band of storms extending from my home up through Virginia along my exact route. What to do? Riding in the rain is not a problem, mind you. It's just water. But beginning a journey in a downpour is not always my idea of fun. The storms were moving in an Easterly direction and at a fairly rapid pace. I was exhausted so I decided a one hour nap made sense. I could recharge my batteries and allow the storms to continue their course. Both were good decisions. When I finally rode away from the house at 6PM the weather was wonderful. The air had cooled and there remained just a hint of moisture along with that wonderful smell the earth has after a good rain. That's one of the joys of riding a motorcycle. Since one is out there in the midst of nature all of the senses are engaged. I headed up Interstates 85 & 77 toward Mt. Airy, NC. Unfortunately, darkness arrived before I did and exit 82 in Jonesville, NC was a convenient place to stop. Andy Griffith will have to wait for another day. I found a reasonable hotel and checked in. After a quick meal, some time in the whirlpool and a hot shower I'm ready for bed. Scarlett O'Hara famously said, "Tommorrow is another day." I'll get an earlier start, make up some lost distance and feel better about myself. I wasn't sure this trip would ever begin but it has and I'm grateful. Since so many have asked I am finally beginning a "real" blog. I've been submitting posts to the web for the past five years in various forms containing mostly technical content, but I've never really posted anything about my own life journey. Frankly, I've been shamed into this. I have encouraged so many others to blog about their lives and families and they have done so. But not me. It was so much easier to read and enjoy others' work. I have dodged for the last time the question: "So, where's your blog?" For better or for worse, here it is. I'll write more about the whys and the hopes of my personal space on the world wide web but for the immediate I will simply chronicle my upcoming motorcycle trip to New England. That journey begins tomorrow afternoon and will continue for the next several days. So, come along for the ride!